My food blog Vegventures has started its journey around the world, trying out vegan(ized) foods from all different cuisines of the world. 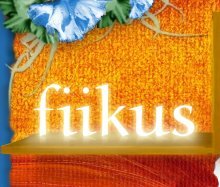 I'm working on a vegan food book (partially but not only a cookbook), which should finally be out in 2014, sadly only in Finnish (of course, translation rights can always be bought!). The book is being written with special attention to several other special diets, like sugar-free, gluten-free and even low-carb (with some fat-free and raw recipes), but that's all I can reveal at the moment. You can use almost any spices here. Herbs like thyme, tarragon, basil, mint, chervil, lovage and chives work well, or you could use some Indian-inspired spices like coriander, cilantro, garam masala, ginger, nutmeg and cumin - or a mixture of these two. I bet lemongrass would also work marvellously. Cut the carrot into pieces and chop the onion and garlic. Cook them in a small amount of liquid until a bit mushy (if using a bouillon cube, add it into the liquid, and dried spices can be added as well). Puree with a blender or food processor. Add the oil, lemon juice, spices and salt to taste, as well as liquid if needed. Some soy/rice/almond milk, soy cream or coconut milk/cream/powder can also be added, but is by no means necessary. You can even puree in (silken) tofu or cashew nuts for a more creamy and nutritious dish. Serve over pasta. 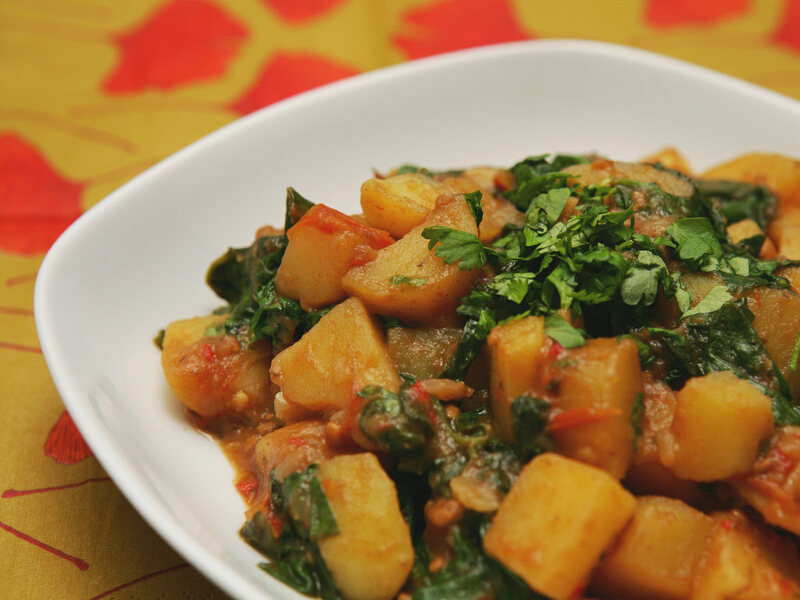 Sweet potatoes also work well in this dish. 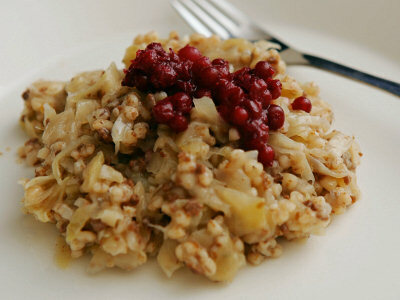 This recipe originates from a Finnish lifestyle magazine. It is very simple but tasty, one of my and my boyfriend's favorite dishes. Cut the cauliflower into small florets and boil in a small amount of water until done, but still crisp (a microwave oven works wonders for this). Chop the onion and garlic and sauté in oil for a few minutes. Add the cauliflower and sauté for a few more minutes. Serve over pasta. Macaroni casserole is a traditional Finnish dish, one people commonly list as their favorite food - of course the particular variety cooked by their mom. Ready-made options are also popular. The traditional macaroni casserole is far from vegetarian, as it contains eggs and milk (to create a sticky omelette-like "matrix" which holds the dish together) and almost always minced meat. Soak the soy protein in the water seasoned with ingredients listed in the same section, or prepare the "mince" you're using. Grate the carrot and chop the onion and sundried tomatoes. Boil the macaroni in water seasoned with salt or a bouillon cube for about five minutes (it is not supposed to be fully done!) and drain it. Mix all the ingredients (except for the topping, if using) in an oven-proof casserole dish and add the topping, if using. Bake in 200C/390F oven for about 40 minutes. Makes about four portions. Jerusalem artichokes are my favorite vegetable. If you have never eaten them, fix that as soon as possible! This is a fancy, sophisticated pasta that can (and should be!) served to dinner guests. Technically the only necessary ingredients are Jerusalem artichokes, cashew nuts and lemon, everything else can be left out or substituted with other things (though obviously the result won't be the same if you leave out everything). Fry the onions in a little vegetable oil for a few minutes. Add the garlic and fry for a few more minutes. Peel the Jerusalem artichokes, cut them into about 0.5" cubes and place them in a saucepan. Cover with water (this water is not included in the ingredients list!) and boil without the lid for about five minutes. Meanwhile blend the cashew nuts, the water listed in the ingredients and the corn starch with a blender or a food processor into a smooth paste. Add this paste and all the other ingredients except for Dijon mustard, lemon juice and lemon zest (and fresh herbs, if using them) and cook until the Jerusalem artichokes are done (soft in the middle, still slightly "al dente" on the edges). Add the rest of the ingredients and check the taste, e.g. whether it needs more salt. If the sauce feels too tart, you can add a sprinkle of sugar or other sweetener. Serve over pasta. Makes about 4-5 portions. Boil the lentils and the onion (and the carrot, if using) in the water seasoned with soy sauce and the bouillon cube until done and puree using a blender or a food processor. Add the other ingredients and spread into a loaf pan (a rectangular, fairly narrow pan). Bake in a 175C/350F oven for about 50 minutes. Makes 4-5 portions. This colorful take on hummus (chickpea dip) originates from a Finnish leftist magazine which features one recipe in each issue. There is no tahini, but nothing is stopping you from adding some. This recipe makes quite a lot, so you could halve it if cooking for one or two persons. Soak the chickpeas overnight and boil until soft. Peel and dice the beetroots and onion and boil until the beetroots are done. Add the chickpeas, puree in a blender or food processor and season. Good served as a dip, on sandwiches and tortillas and even as a pasta sauce. Lindström's steak burgers are a traditional Finnish dish, minced meat burgers which contain beetroot (pickles and/or capers are also sometimes added, so add some capers if you are so inclined). This is my own version which combines beetroot with beans. Slice the beetroot and cook. Blend with the beans and onion (using a blender or a food processor), season and form into burger or meatball shaped patties. Bake in the oven at 200C/390F for about 40 minutes. I'd assume you can also fry them, but I haven't tried it, so I don't know how long it takes. Serve with potatoes, rice or salad and a sauce of choice, or in hamburgers. Soak the chickpeas overnight or for at least six hours. Cook until soft, about 45 minutes. Sauté the onion and combine all ingredients. Add more spices if needed. Puree with a blender or food processor until fairly smooth. It's alright if a few whole chickpeas or chickpea chunks remain. Some people add baking powders, others don't. I haven't noticed much difference either way. 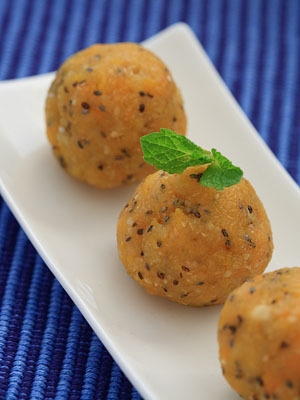 Shape into balls and fry in oil, deep fry or bake in the oven (200C/390F, 30-40 minutes) for a healthy alternative. If using the baking method as I usually do, it's a good idea to add some oil in the mixture to avoid drying them out. Serve with a tomato sauce (and a yoghurt/tofu sauce if so inclined) and rice, bulgur, potato wedges or pita bread. My own simple chili recipe which is easy to vary. You can leave out the marjoram and Dijon mustard if you want or don't have them, bu don't leave out the cocoa powder, because it adds body and richness to the taste. The maple syrup can be replaced with some other sweetener, brown sugar would probably work the best. Chop the onion, garlic, bell pepper and chili pepper. Sauté the onion for a few minutes. Add the garlic and chili peppers and sauté for a few more minutes. Add the crushed tomatoes, tomato paste and the bouillon cube and cook for about 10-15 minutes. Add the rest of the ingredients except for cilantro (if using), bell pepper (and corn, if using frozen - if using fresh, add it now). Cook for about 20 minutes, while occasionally stirring. Add the bell pepper and corn (if using frozen) and cook 10 minutes more. If you want to add chopped cilantro, add it when the dish is otherwise done. 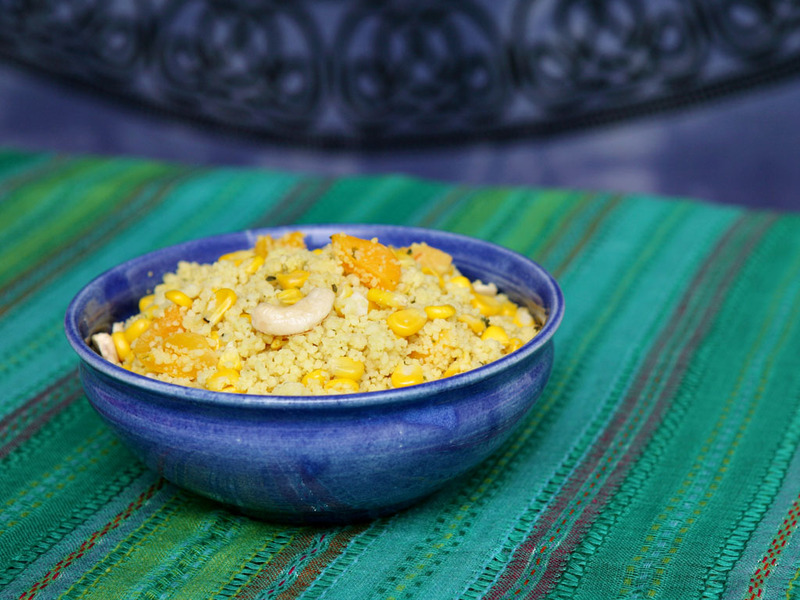 Serve with rice, bulgur, quinoa or bread - or as it is. Makes about 6-8 portions. Borts soup is a traditional Russian soup based on beetroot. It also includes meat, which has been left out in this edition. Traditionally it has been served with a dollop of sour cream. You can use a soy-based sour cream, or just leave it out. If you keep the soup in the fridge for 4-5 days, it starts to slightly ferment (think sauerkraut, not booze) which creates a slightly sour taste that I find pleasant - and which mimics the acidity given off by the sour cream. Grate the beetroot and cabbage with a large blade. You can grate the other veggies too or chop them. Place everything in a large pot with a sufficient amount of water and cook until soft to your liking (30-60 minutes). If you are an American, you might have a hard time believing that in Finland hardly anyone cooks with pumpkin. In fact I am the only person I know who does, except for my grandma, who used to make pumpkin relish. We do have pumpkins in all the big grocery stores in the fall, but canned pumpkin is not available here. Unlike with most recipes, the amounts are per person, so if you are cooking for, say, four, multiply by four - it doesn't really make sense to prepare just a single portion. Cut the pumpkin flesh into about 5x5 cm (2x2 inch) cubes and deseed them. The size doesn't really matter, as long as the pieces are fairly equal in size. Roast the pieces in the oven in 175C/350F for 40-45 minutes. Also roast the garlic cloves simultaneously, but they only need 20-30 minutes (after which they will burn), so be careful. The pumpkin is done when you can easily pierce it with a fork. The edges may get a bit burnt, but it's alright. You can cut them off if you want to. Puree the pumpkin pieces and the roasted garlic with a blender or a food processor. You can start with only a part of the garlic, but remember that it's much milder after roasting. Add the spices and the coconut milk (powder). You can substitute it with oat or soy cream if you want. If the soup tastes very bland, add more of the spices (especially garam masala) until the taste is rich, though be careful with the nutmeg. Serve as a hot soup, or you can also use it as a pasta sauce similar to the carrot pasta. This recipe originates from Fat-free vegan, but this is a simplified version which only uses wild vegetables (you can use spinach and other non-wild greens, but then you might as well use the original recipe. If you don't know these plants, a Google Images search will probably reveal whether they grow in your area. Just be careful not to pick anything you don't fully recognize (I've been told goutweed looks like poison ivy, which doesn't grow here in Finland) and use gloves when picking stinging nettle. I'd almost recommend freezing these wild greens for this soup, as it tastes more like winter food, but you can't get the greens in the winter. Chop the garlic and the onion. Brown the flour by stirring it on a dry pan on moderate heat for about 10 minutes, until it is slightly brown in color. Don't let it burn or you'll have to start from scratch. You can skip this step if you'd rather not use flour. Move the flour to another container and sauté the onion for a few minutes on the pan. Add the garlic and the bay leaf and sauté for a few more minutes. Stir in the browned flour. Add the water a little at a time while stirring as not to clump the flour. Add all the other ingredients and bring to boil. Simmer for about 10 minutes. Puree with a blender or food processor and cook for an hour more. about 600-700 g/1.3-1.5 pounds veggies, e.g. If you're looking for an Indian curry which is based on neither tomato sauce or cream, this one is a good choice. Note that it is a dry curry. (I sometimes want to eat a non-tomato based curry simply because I get tired of tomato sauces if I eat them all the time). As a funny anecdote, Masala is (besides the Indian name for a mixture of spices) a place near Helsinki. Chop the chili, vegetables, onions and garlic. Mix the coriander, chili powder, salt, black pepper, turmeric, ginger, tamarindi and water together in a small bowl. Sauté the onion and garlic in oil for a few minutes. Add the spice mixture and sauté for a few more minutes. Add the vegetables, chili peppers and brown sugar. Cover the pan and simmer until the vegetables are done. You can add a little water if it seems too dry. Serve with rice or naan (note that ordinary naan can contain several animal-based ingredients). One of my favorite Indian foods, not very fiery or otherwise spicy. Chop the onions, garlic and spinach and dice the potatoes into small cubes. Sauté the onion and fenugreek in oil for a few minutes. Add the garlic, chili powder, coriander and salt. Sauté for a few more minutes and add the potatoes. Keep cooking for about five minutes more. Pour in the water and the rest of the spices. Cover and simmer for about 15 minutes, until potatoes are done. Add the spinach after that and cook only until it's heated through. If the result seems too soup-like, you can uncover the pan and let the excess liquid evaporate. Serve with rice or naan (note that ordinary naan can contain several animal-based ingredients). Saag paneer or palak paneer is one of the most popular Indian vegetarian dishes. In this vegan version tofu takes the place of paneer, a type of fresh cheese. If you want you can find several pages online with ideas on making the tofu more paneer-like. The most important thing, however, is the use of spices. I feel like most recipes are too low on them. My own version has been inspired by a recipe in the blog Garam Masala (in Finnish), although I use a different method of preparation. I think this version has a tastier sauce than in my favorite Indian restaurant, which already beats many other Indian restaurants. Cut the tofu into slices. Press moisture out of them between tissues or tea towels, preferably for a while. Cube the tofu. Fry the onion in the oil for about five minutes. Add the garlic, chili and ginger and fry for a few more minutes. Add the remaining spices and fry for a little bit. Add the tofu and fry for a few more minutes. Add the spinach and let simmer for a while. If you want you can also add soy/oat/coconut/cashew/almond cream. Serve with rice. Ok, I confess. This is based on a recipe from Veganomicon, but it only had cumin and coriander, I added the other spices. This is a tasty, healthy and simple dish that goes great as a side for any Indian food (or otherwise). When you first taste it, it may not seem like anything special - but after a few bites you just keep eating it, because it's so good. Cut the cauliflower into florets. Put all ingredients in an oven-proof casserole dish and stir to mix. Roast in 220C/430F for 20 minutes turning once or twice, or until done to your liking. carrot sliced thinly into "coins"
This is kind of a "comfort food" pilaf I used to eat a lot back when I couldn't really afford any other veggies in the winter but carrots, onion and cabbage (the parsley came from the freezer). Cook the rice together with the spices. Sauté the onion and carrot (and tofu if using) in oil for a while. Combine all ingredients. Cabbage casserole is a traditional Finnish dish, which people either love or hate (I'm one of the lovers, in case you didn't guess). Traditionally it contains minced meat (yes, just about all Finnish food does) and is baked in the oven. This version is done on the stove, as the results are very similar and it saves you some dish-washing and other hassle. It is nutritious, low-fat and very inexpensive to make. Barley has a very low glycemic index and is thought to be the grain that keeps you full for the longest time. Slice or grate the cabbage and onion. Put all the ingredients in a large pot and cover with water. Cook for about 45 minutes. If you're using rice or bulgur instead of barley pearls, add them about 15-20 minutes before the dish is done (depending on the cooking time of the grain) so that you won't end up with porridge. 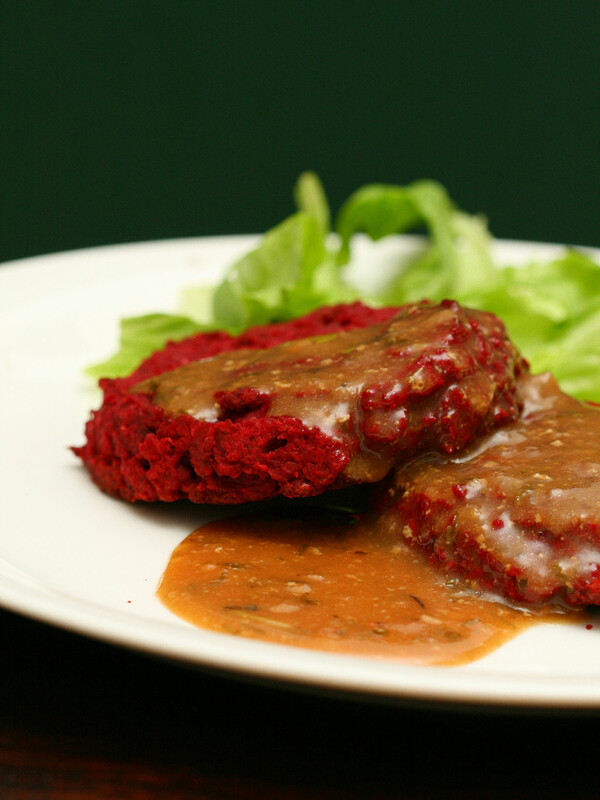 Please don't take the name to expect this to be a "fake" meatloaf, it's not. But I wouldn't hesitate to serve it to people who don't like mushrooms, I just wouldn't tell them it contains them. This recipe originates from VegWeb many years ago, though I've adapted it in some ways - can no longer remember how and the original recipe seems to have disappeared. This recipe is easy to vary - you can use fresh/frozen/dried and reconstituted mushrooms, or you can replace some or all of the nuts with seeds, e.g. sunflower seeds or hempseed. You can add cooked vegetables, seaweed and stuff, too. You could probably use some cooked gluten-free grain to replace the bread crumbs, though the result might turn out more mushy. Blend everything together with a blender or food processor. Add the spices - you can use quite a lot of herbs, but be careful with salt, soy sauce and mushroom sauce, as most onion soup mixes contain quite a bit of salt. Oil a loaf pan (unless using non-stick one). Spread the loaf mixture into the pan and flatten the top. Bake in a 175C oven for 45-50 minutes. The loaf should be rather soft when you remove it from the oven and for some time afterwards, but if you let it properly cool down without cover it should turn very solid. Serve with potatoes and gravy (cranberry sauce and mushroom gravy work well) or on sandwiches. This recipe originates from a good friend, who first served me this dish. He had got it from a family member, but the recipe did not mention any amounts, so I had to make them up. 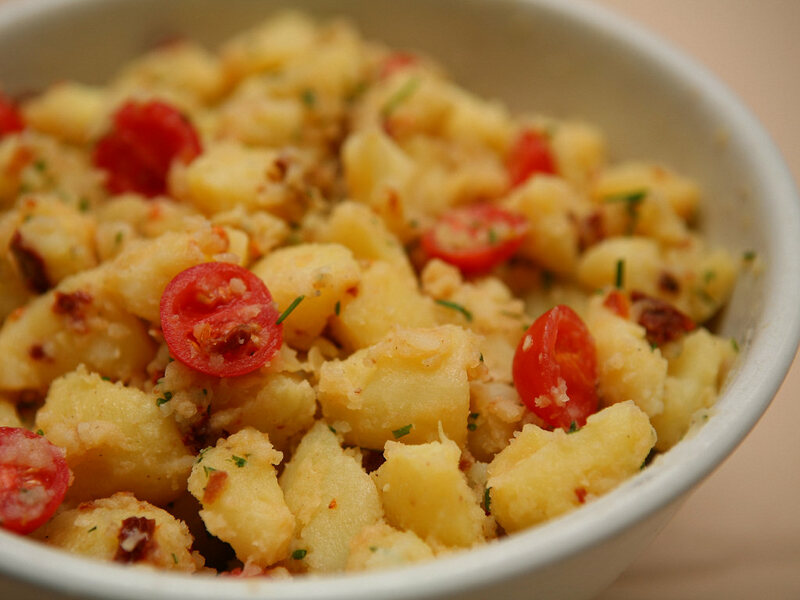 It is my favorite potato salad and good for serving at parties, because it keeps better in room temperature than most salads. It makes about four portions, though not very big ones. It does not feel greasy despite the amount of oil, because the potatoes absorb most of it. The sundried tomatoes and their oil are the whole "trick" to this salad, so don't substitute them with anything or be too stingy with the oil. Boil the potatoes until done. If not using new potatoes, peel them before cooking. Cut them up into small cubes while still warm (this is why you have to peel them in advance if necessary, as it is possible to cut warm potatoes, but peeling them is much more difficult). Add all the other ingredients but cherry tomatoes and 1 tbsp of the oil and mix. If making a very large batch, add some of the ingredients as you go, then cut up more potatoes (because they soak up the oil and spices better when hot, and if you have to prepare a large amount the first ones may cool down too early). Add the rest when the potatoes have cooled down to at least room temperature. Put in the fridge and preferably let marinate for a few hours before serving. Tzatziki is a Greek yoghurt based dip with garlic and cucumber, which I love to use as a dip. 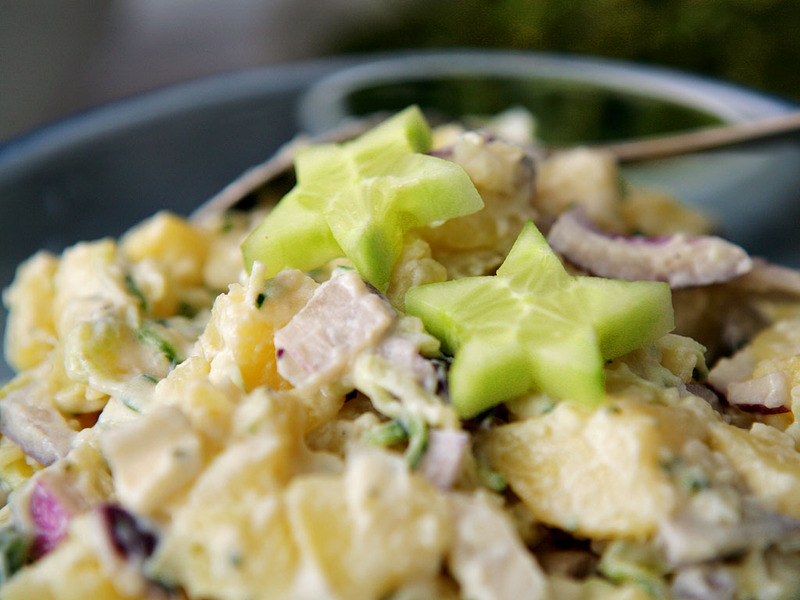 This potato salad proved a huge hit in my book release party. Unlike most potato salads it is fairly low on fat and refreshing. This recipe makes about four portions. Boil the potatoes until done. Peel (if not using new potatoes) and cube them. Grate the cucumber. Mix the sauce ingredients (everything but potatoes and red onion) together. Mix everything together and let marinate in the fridge for at least several hours. If you try the tzatziki sauce as it is, note that a) it takes several hours for the final garlic flavour to develop; initially it will taste much milder, but on the other hand b) the sauce will be noticeably "diluted" when it is added to the potatoes. Someone on Twitter gave me an idea for this dish, albeit no recipe, so I had to try it out. My first try was way too bland, but even this version isn't as spicy as the ingredients might suggest. Cut the cauliflower into florets. Mix the oil and mustard together. It can be stirred into a smooth emulsion, but it will curdle nastily as soon as you add the lemon. Mix all the seasonings (except for salt) into the oil mixture and brush it on the cauliflower (or roll the florets in the mixture). Spread on a baking sheet and sprinkle salt on the top. Roast in 220C/430F for 20 minutes turning once or twice, or until done to your liking. The seasonings of this recipe may be somewhat exotic, including a Middle Eastern spice mix called za'atar (use the kind that also includes sumac, easily recognized by its red color), but the result is well worth it. For years I was a Brussels sprout hater and even after that I assumed the only way to prepare them with delicious results was oven-roasting, but I was wrong. Cut the mushrooms into fairly thin slices. If they are big, you can halve the slices, but don't chop them finely. Cut off the stems from the Brussels sprouts and slice them fairly thinly length-wise (different direction than when destemming them). Lots of leafy parts will come apart, but worry not. If the Brussels sprouts are huge, you can also halve these slices. Fry the mushrooms on a pan without oil - you may need to sprinkle a little water on them initially to avoid burning - until they have shrunken down and most of the water has evaporated. Remove the mushrooms from the pan to a plate or bowl. 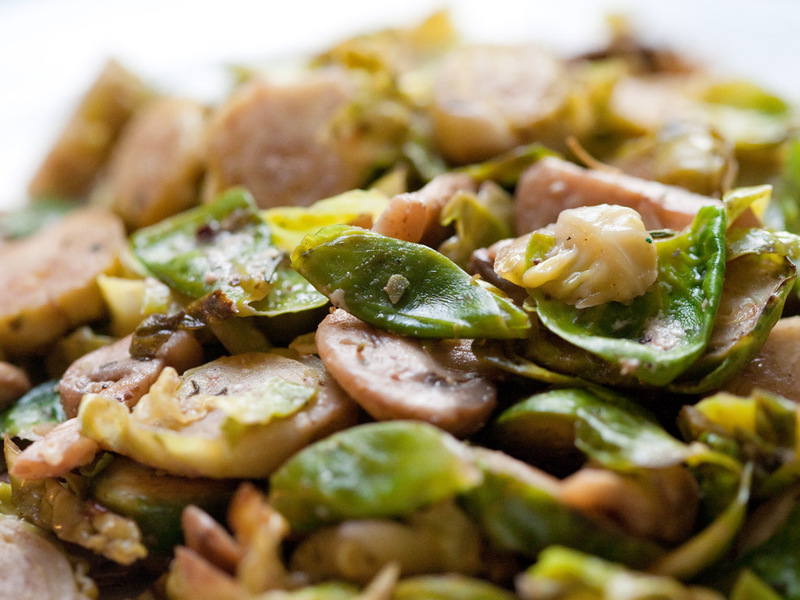 Heat both of the oils on the pan and fry the Brussels sprouts on medium heat for 6-10 minutes, until tender. Add the sugar, mix well and set the heat higher. Fry the Brussels sprouts on the higher heat for a few more minutes until slightly browned and caramelized (don't stir them too vigorously or they will fail to brown). Add the za'tar, salt and mushrooms and fry for a bit more. Add the nutritional yeast, dtir well and serve. This recipe was inspired by several oyster mushroom recipes which either used nori or other seaweed to enhance the supposedly seafoody taste of oyster mushrooms, or lemon. I also wanted it to have other Japanese influences besides just the nori. I have never tasted oysters, but this dish probably has nothing to do with shellfish. Hence, noysters. Interestingly immediately after frying the mushrooms may taste too strongly flavoured or unbalanced, but after wrapping them in the nori, suddenly it all balances out. Must be magic or something. Fry the whole oyster mushrooms on a pan without oil, you can again sprinkle on some water if it looks too dry otherwise. When the mushrooms start releasing their juices add the miso, soy sauce and lemon juice and stir well. Fry the mushrooms until most of the liquid has evaporated. Add the oils and lemon zest and continue frying for a few more minutes. There should be no more liquid on the pan. Cut wide strips of the nori sheet and wrap the mushrooms in it. My favorite combination in this dish is half carrot, half parsnip, but you can also use beetroot, sweet potatoes, celeriac, Jerusalem artichoke etc. Pumpkin, cauliflower, eggplant and bell pepper might also be tasty, even though they aren't root vegetables. Keep in mind that if you're not using root vegetables it can result in very different cooking times. In that case you may have to chop some ingredients much smaller than others. Cut up the veggies into evenly sized cubes. 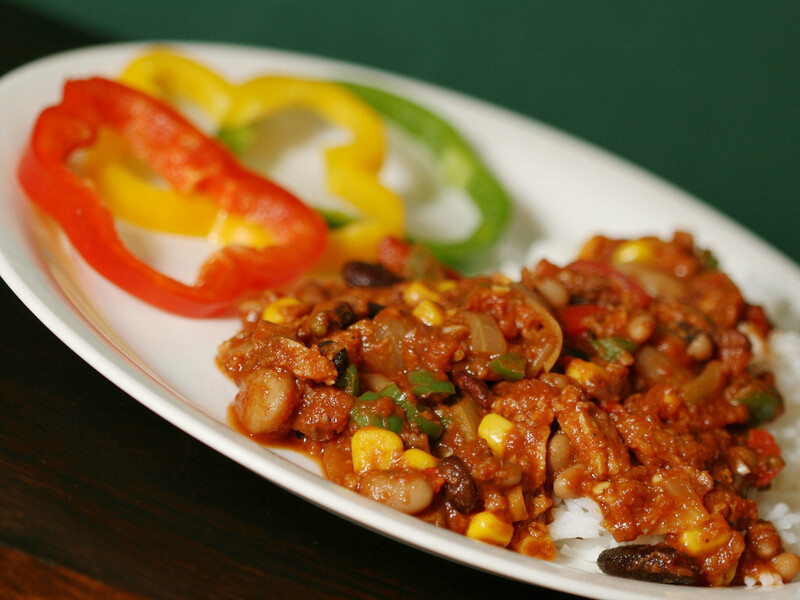 Mix the other ingredients together and pour that and the veggies into a casserole dish. You can also add herbs and pepper. Mix well so that the liquid covers all of the veggies. Roast in the oven at 200C/390F for about 45 minutes, depending on the size of the cubes. Stir the veggies a few times during the roasting. The best way to check the doneness is - surprise, surprise - to remove one cube and taste it (don't burn your mouth!). Pour carrots into a saucepan and add only a little water, so that you can boil all the liquid out. Boil them for a few minutes, careful not to burn them (add more water if needed of they are not done yet). When they're dry and slightly soft but still crisp, immediately add the oil and spices and stir for a minute or two. Serve with Indian food or as a side to just about any meal. This is a real power food especially if you use turmeric, due to the anti-inflammatory and other health-promoting effects of ginger, garlic and turmeric. Many people think you cannot make potato wedges in the microwave. I disagree. At least I have been successful. Wash the potatoes thoroughly (don't peel them) and cut them into 6-8 wedges, preferably evenly sized. Mix the spices and oil. Roll the potatoes in the spice-oil mixture or use a . Place the potatoes on a microwave-safe plate upwards (the peel side down). Use other wedges to support potatoes that do not otherwise stay in this position. Heat in the microwave oven for 8-15 minutes on full power, until the potatoes are done but not dry. The time depends on the microwave oven and the amount of potatoes used (using my ancient microwave oven it took almost 15 minutes, but could be a lot quicker with a new, more powerful oven). Bring the water to boil and add the bouillon cube, turmeric, mint, lemon and parsley. Stir until the bouillon cube has dissolved. Add the couscous and stir well, cover and remove from the stove. Let it sit for a few more minutes, stirring occasionally to avoid clumping, until the couscous has absorbed all of the water. Chop the garlic finely. Roast the cashew nuts slightly by stirring them on a dry frying pan (you can skip this step if you use preroasted cashews, but if they are salted, as they most likely are, you'll have to rinse the salt out). Pour them into the couscous. Sauté the garlic and corn together in a small amount of oil for a few minutes. Pour the mixture and the apricots into the couscous and stir. This is the kind of recipe I recommend if you end up with loads of apples in the fall. I do prefer mango chutney to apple chutney, but at least here in Finland I'm yet to encounter a mango surplus... I guess you could substitute mango or plums and see what happens. This recipe stems from the cookbook Vegetarian Indian, though I've adapted it slightly. According to the recipe this only keeps in the fridge for 2-3 days, but I doubt that. Considering the amount of sugar and vinegar it should keep for much longer, and I think you can freeze or can it. Peel the apples and cut them up into small pieces. and place everything in a saucepan (except for fresh mint, if using). Boil on medium heat until mushy and most of the liquid has evaporated. Mash the apples with a fork during cooking, so that the end result is jam-like, but still chunky. Serve with e.g. lentil dishes. This sweet, slightly tart and usually just a little (if at all) hot chutney is my favorite chutney and goes very well with e.g. lentil dishes. This recipe makes quite a lot and because it's not very acidic it will keep a few weeks at most, so you can halve the recipe. Many recipes have no vinegar, but I like adding some. Many recipes also feature jaggery or brown sugar, but I find the sweetness of the dates makes it unnecessary, unless you want to use more tamarind. Tamarind is a very tart fruit which is also a part of HP and Worcestershire sauces. You can find it in Asian groceries and these days probably also in supermarkets. Some people also add fennel, anise or ginger to this chutney. Place all ingredients in a saucepan and cook for some 20 minutes. Add more water, if it looks too thick. Check the taste and add salt, sugar or spices if you want to. Puree with a blender or a food processor. Serve chilled or in room temperature. Blend tofu and ingredients from either variation into a smooth paste using a blender or food processor. You can of course add other herbs, like parsley. This spread keeps in the fridge for about four days - after that it begins to get sour in taste. 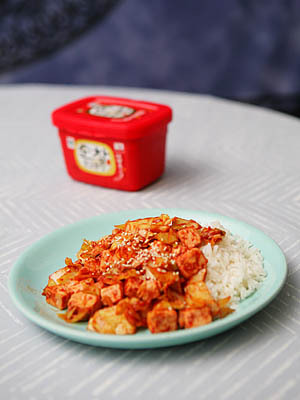 Excuse the punny name, this sauce blends the salty hoi sin of Chinese cuisine with the fermented Korean chili paste gochujang (which has a rather paprika-ish taste, not awfully hot). This sauce works great for Asian stir-fries and such. This gravy is omnivore-friendly and goes well with e.g. seitan, potatoes and Beanström's burgers. You can substitute most ingredients or leave them out if you don't have them. Put everything but the starch together in a saucepan and bring to boil while stirring. Separately mix with a splash of water in a small glass or bowl and stir until combined. Pour into the sauce while stirring and let thicken for a moment before removing it from the stove. Makes about 1.5 cups or 3-4 portions. Finns tend to call bundt cakes "kuivakakku", dry cake, but this cake is anything but dry, it's lusciously moist. They often feature dates, spices and sour milk. With yoghurt and spices this is somewhat traditional. I got the recipe from my mother-in-law, I'm not sure where she got it. The recipe was already egg-free, but contained butter and yoghurt, which were of course easy to veganize. I added the vanilla and I've also tried it with oil instead of margarine. The recipe is pretty tolerant of substitutions and gimmicks, I've successfully tried e.g. replacing 1/3 of the sugar with erythritol, which can easily make baked goods dry. So I use a mixture of erythritol and coconut sugar. Preheat the oven to 175C/350F. Mix the dry ingredients in a bowl. Melt the margarine and let cool for a bit. Add the fruit puree and yoghurt to the margarine. Mix the liquids with the dry ingredients. Pour the batter into a bundt cake pan. Bake for 1 hour. Let cool completely before inverting. I don't know if these should be called pancakes or crepes. In Finland they are usually baked on a special pancake pan, which has four (or sometimes 7-9) round indentations for pouring the batter, but sometimes they are made on a normal pan or a huge cast iron pan placed on top of open fire, called muurikka. To confuse things further, the dish called "pancake" (pannukakku) in Finnish is made with the same batter (just a little thicker), but baked in the oven. However, just about everyone prefers the fried variety. Both kinds are traditionally eaten with strawberry (sometimes raspberry) jam and sometimes vanilla sauce or whipped cream. In Finland pancakes are not traditionally eaten at breakfast, but as a dessert or as a not-so-healthy meal, often at the summer cabin. I think the same batter is essentially used for most European crepes (e.g. French and Dutch), thinner than American pancake batter and without leavening agents, but Finns may be the only ones who use a pancake pan (?). As I said, you can use a normal frying pan, non-stick or cast iron, but you may have to adjust the amount of flour slightly. If the pan isn't non-stick, you will probably have to add a little oil for each pancake, or after every two pancakes. Many people add oil anyway even with a teflon pan. Mix all the ingredients together. The batter should be almost completely free of lumps. It should be refrigerated for about 30 minutes before frying the pancakes, which will also help dissolve some of the lumps. Heat the pan to medium or medium-hot temperature and fry a test pancake. Usually the first ones will be a little weird, because the pan won't be hot enough yet, even when you think it is. The pancakes should be about 2 mm thick. Be careful not to make the pancakes too big. Some people are skilled enough to flip a pancake filling the whole pan (sometimes by throwing them upwards! ), but most can't do it. It is ready to flip when it is mostly firm. The pancakes should be somewhat brown on the first fried side and mostly golden on the other side. This makes enough for 2-3 people, or more if eaten as a dessert. 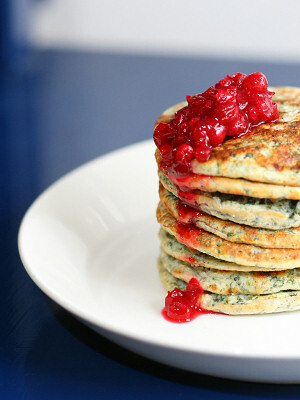 Spinach pancakes are a traditional Finnish main dish, served widely in schools and other lunch cafeterias and are a very popular store-bought food. Sadly the store-bought varieties are usually very bland and contain very little spinach. My grandma used to add minced meat to her spinach pancakes (I don't know how traditional this is) and when I went vegetarian she bought small TVP granules and used them instead - I didn't give her this idea or anything, she is just awesome like that. Fry the pancakes as per the instructions of the previous recipe (they will be a little thicker and less crisp, though). This makes enough pancakes as a main dish for about 3-5 people. If you're more used to American pancakes, you could alternatively just add spinach to your ordinary pancake recipe, add a little salt and leave out the sugar. Spinach pancakes are always eaten with lingonberry jam over here. If you can't find it, cranberry jam or cranberry sauce would probably work, as cranberries are quite similar to lingonberries. You could try other condiments too, but on their own the pancakes are quite bland. Classical Finnish cookies, extremely easy to make. Can be served as a dessert topped with e.g. berries and ice cream. Mix all the ingredients. Form into small blobs on baking parchment. Bake in 200C/390F for about 7 minutes. These are quite plain cookies, but very delicious. The use of these "egg substitutes" (banana and soy flour) creates cookies that are slightly crisp on the outside but moist on the inside - much better than the original recipe of traditional Finnish cookies, which uses two eggs. I don't know if you can substitute flax seed, soy yoghurt or something else for the soy flour liquid mixture. The cookies keep for up to two weeks - if you really have any left after that time. Beat soft margarine and sugar into a somewhat fluffy mixture. Mash the banana into a smooth puree and mix with soy flour and apple juice. Mix dry ingredients together. Combine the banana paste, the fat sugar mixture and the dry ingredients and mix into a batter. Don't overmix. Form into small cookies and bake in 175C/350F for about 10 minutes. I cannot remember how many cookies this makes, but I think it is about 20-24. These muffins are gluten-free, but don't take that to mean that they aren't as good as normal muffins. They are moist, soft and delicious, best straight out of the oven, but they are edible for several days. You can also add nuts, dried fruit or chocolate chips. For the puree you can use e.g. carrot, mango or apricot. The original recipe used sweet potato, but we've mostly used baby food fruit purees. This recipe is extremely easy to make and easy to remember, as well. However, we haven't got it to work with metallic muffin cups (they don't raise properly or sink afterwards, for some reason), only by using paper liners without cups (I also have a silicone muffin pan but I haven't tried it yet). This recipe makes 8-12 small muffins. Mix all the ingredients using a blender or a food processor. The batter should be thick, sticky and gooey. If it feels less than thick (which may happen if you use a baby food puree as they often have added liquid), add a little bit of flour. Spoon into small muffin liners. Bake in 200C/390F for about 15 minutes. Quark pie is a traditional Finnish dessert topped with a mixture of quark (a low-fat curd cheese which is somewhat like yoghurt but thicker and creamier), eggs and cream, with several variations. It is a bit like those cheesecakes that are baked. Some people only use quark at the top and only add raisins. A quark pie made using canned apricot or peach halves is often eaten on Easter. In the summertime people use raspberries, blueberries or a combination of them. This vegan version uses tofu and a non-dairy milk/cream to emulate the quark topping. You can use any non-savoury pie crust. If you don't have a recipe, you can just mix water, flour and oil until it resembles a pie crust. You can add a sprinkle of salt and some sugar, but it's not necessary. Grease a pie pan (if needed) and spread the crust at the bottom and to the sides. Blend the tofu and the liquid with a blender or food processor until smooth. The consistency should be like thick yoghurt or a little thicker. If you are not using soy milk or cream, you may want to add 1 tsp of corn starch, because the lecithin in soy adds as a thickener. Add the sugar, vanilla and the lemon juice. The result should be sweet but with a hint of tartness. Remember that the berries have not been sweetened, so if you use tart berries (like currants) you may want to add more sugar. If you are using frozen berries which have been sitting in the freezer for a while, rinse them quickly with cold water in a sieve, to rinse off some of the "freezer taste". You can fold the berries into the tofu mixture, or first spread the tofu mixture on top of the pie crust and then add the berries (you will probably have to press them in). If the berries are very moist, the latter method prevents the tofu mixture from turning red/blue, which might make the result more aesthetical. Bake in a 200C/390F for 20-30 minutes, depending on how wet the topping is. It should not brown at all, so remove it from the oven after 30 minutes, unless the topping is still very liquid (which should not happen). Let it cool and serve chilled or at room temperature. Keeps for 3-5 days in the fridge. I don't know if it can be frozen. Perhaps more cupcakes than muffins, this recipe originates from the wonderful Tofu for Two blog, but luckily Heikki and Anni allowed me to post my own adaptation. 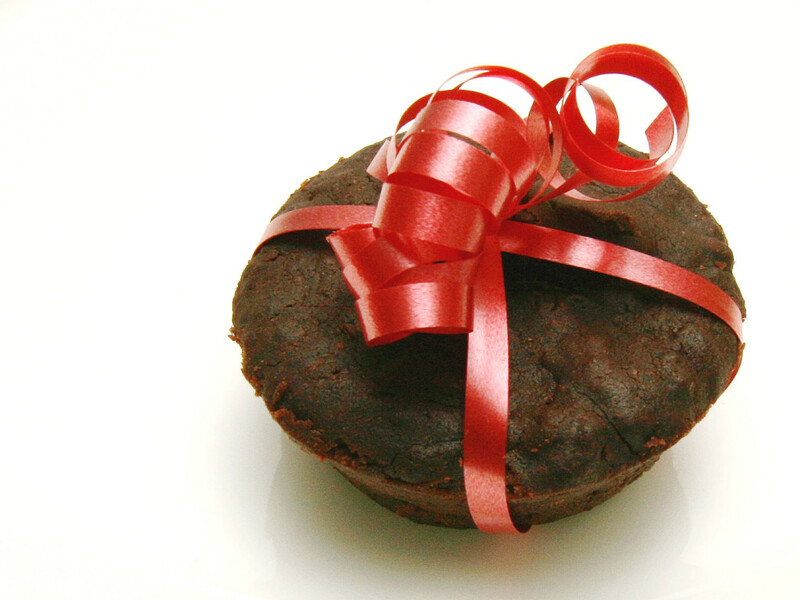 These muffins use more holiday related ingredients and spices - besides spices also prune puree and almond extract. They are fairly healthy as far as chocolate muffins go, less fat than most (mostly oil) and contain many antioxidant/nutrient packed ingredients like cocoa, soy, cinnamon, prunes and brown sugar. I've also tried adding balsamic vinegar, which goes great with the taste, but the muffins don't rise so well as I feared. I guess the pH of the batter drops too low and some of the baking powder should be replaced with soda. You can try this addition if you want to take the risk (they are not in any way ruined even if they don't rise properly, but they just don't look as good). You can make the muffins more Christmassy by adding things like raisins/sultanas, rum extract, grated lemon zest, preserved cherries, crushed almonds, nuts and/or dried cranberries. Mix the dry ingredients (everything up until nutmeg) together and the wet ingredients together in separate bowls. If the melted chocolate becomes very clumpy when you mix it with the other liquids, put the entire bowl containing the wet ingredients in the microwave and nuke on low power (even the thawing mode may work) until the chocolate melts in nicely. Mix wet and dry ingredients together. Pour into 12 muffin cups and bake in 175C/350F for about 15 minutes. You can decorate the muffins with e.g. almond flakes. This is my grandma's Christmas cookie recipe, which may have a bit of a misleading name, as it is not all that close to gingerbread (despite the spices) nor are the finished cookies shaped like balls, but this is the most accurate translation nonetheless. I tweaked the recipe to make it vegan by replacing the egg with soy flour and liquid. Beat the margarine, sugar and molasses together until somewhat light and fluffy. Mix together the soy flour and the water or apple juice and pour into the margarine sugar mixture, while still beating it. Mix the dry ingredients together and add to the rest. Do not add all flour at once - you should only add so much that you can form the dough into small balls, it shouldn't be too stiff. Form the dough into small balls. This recipe should make 80-90 tiny cookies, so the balls should be fairly small. After you've made the first batch, press a hazelnut half on top of each ball (or have someone else top the cookies while you're forming them - even a small kid can do this quite well). Bake in 175C/350F for about 8 minutes. The cookies will be a bit soft at first, but they're almost better if you let them dry out until crunchy, and that way they will keep for several weeks. I wanted to develop a vegan frosting with a distinct caramel/butterscotch/fudge/taffy flavour, but that wasn't actual caramel (not that there is anything wrong with caramel, but I needed a frosting). In one vegan cookbook I have such a recipe which starts by making caramel and then adding piles of confectioner's sugar, but I didn't find the flavour fudgy enough. So I developed a recipe which has just the taffy flavour I was looking for. If you aren't using coconut milk but some other fatty non-dairy milk/cream, you can replace the soy milk with it, for a total of 5 tbsp. I didn't dare to use this much coconut milk, as I did not want a coconut frosting. This frosting can most likely be piped, if you cool it down just the right time and use the right amount of confectioner's sugar. The amount is for 12 cupcakes (a nice amount smeared on top), but if you want to pipe it on them or frost a cake, I recommend doubling the recipe. You could probably use it inside of a layer cake too, perhaps with something tart, but then you probably need an even larger portion - remember that the confectioner's sugar shrinks down to nothing.) If spread with a knife it isn't particularly fancy, so I recommend additional garnishes such as sweets, sprinkles, chocolate or fruit. Mix the first three ingredients, 2 tbsp soy milk and 1 tbsp margarine in a small saucepan. Bring to boil, lower the heat and cook, stirring, for 3-5 minutes until it resembles fairly thickc caramel. Add to it 1 tbsp soy milk, the vanilla and the sugar. Stir and let cool for a bit. Add the remaining 2 tbsp of margarine (you don't want the hot caramel to melt it, since you are making a kind of buttercream). Mix into a smooth paste. If you feel it is stiff enough, spread or pipe it on top of the cake/cupcakes. Otherwise let it cool for a bit more or add a bit more confectioner's sugar before using. Refrigerate the frosted baked goods. This is an adaptation of these mango coconut balls, but not being such a big fan of coconut I replaced most of it with nuts and made some other changes as well. For some reason I didn't think of adding lucuma, but it works great with mango so should make a lovely addition here, too, maybe 1-3 tbsp. Soak the dried mango in a little water for 30 minutes. Drain and discard the water (or use in cooking/baking/smoothies). Grind the nuts and chia seeds in a blender or food processor into a coarse meal. add all the other ingredients and blend until you have a sticky "dough" (you will likely need to scrape it down to get all of it blended). Roll into balls larger than a cherry but smaller than a meatball. You can roll them in flaked coconut if you want to. Store in the fridge, keeps 1-2 weeks. I learnt this recipe back when I was a little kid. This is a very easy candy to make - perhaps not the healthiest treat due to the liberal use of oil and sugar, but on the other hand nettles are very nutritious (much more so than spinach!) containing massive amounts of calcium, iron, vitamin C and other good stuff. Pick the nettle leaves from plants that are not in flower yet. You may be able to use blackcurrant leaves or other non-bitter edible leaves, but I haven't tried it. Finnish mead is traditionally made for Mayday celebrations. It is quite different from the most common meaning of the word (honey wine). It does not contain honey and is very low on alcohol. Even little kids are allowed to have some. The taste is difficult to describe, a bit like lemonade but with brown sugar, and almost everyone likes it. It is slightly sparkling when made properly. This version is otherwise completely traditional, except that I substitute lime for half of the lemon. Heat water or most of it in a large pot or saucepan. Mix in the sugars, juices from the citrus fruits and citrus peel. Pour into a large bowl or bucket. Add the rest of the water and let cool down to body temperature. Add the yeast. Cover the bowl with a towel or parchment and let brew in room temperature overnight. Bottle in well-washed glass or plastic bottles (you can use e.g. soda bottles). Don't fill the bottles completely full, because the brewing process produces some carbon dioxide and the bottles might burst if filled to the top. Add a few raisins and a tablespoon of sugar into each bottle (most of the sugar falls into the bottom of the bottle, undissolved, feeding the yeast which also falls to the bottom). Let the bottles sit in room temperature for one more day and then move to the fridge. When the raisins rise to the surface, the mead should be done. It usually takes 5-8 days. The mead can be stored for about one week after it is done, though it is generally best to consume it within a few days, as the fermentation continues, turning sugar into alcohol and resulting in a more alcoholic (and less sweet) beverage. Heat the milk and water until boiling and add the other ingredients. Let it steep until the tea is ready, though a bit longer than you'd usual steep your tea (3-10 minutes, depending on the kind of tea). Kulfi is an Indian frozen dessert, often called an ice cream, but because it's not whipped, it's more like French parfait. Normally kulfi mostly consists of evaporated and condensed milk and heavy cream (with pistachio nuts usually added, at least to the kulfi which is served in Indian restaurants in Finland; I believe this is properly called "pista kulfi"). In India it's usually sold in the shape of ice cream sticks, but in the restaurants here it's usually served in a shape like this (the kulfi in the picture was frozen in a silicone muffin tin). 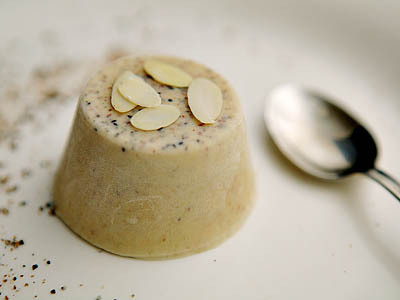 Because the kulfi mixture is not whipped, the dessert will be rock solid when taken out of the freezer. You should take it out 15 minutes in advance to let it soften enough to allow for eating. Don't worry, because of the fat and sugar content it won't thaw like an ice cube - from solid straight to liquid. 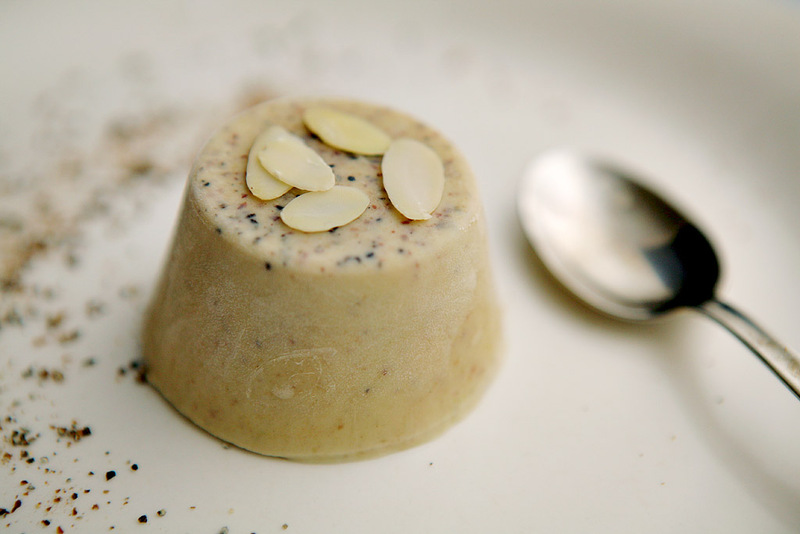 I constructed this recipe based on several non-vegan kulfi recipes and my Indian friend seemed to find it rather enjoyable. If you are using salted pistachio nuts, rinse them in a sieve to wash out the salt. While doing this you can also push off some of the inner skins of the nuts. Use a blender or a food processor to grind the cashews, almonds and about 1/3 or 1/2 of the soy milk into a fine paste. After that add the pistachio nuts and blend until they're ground but not a complete paste (you can add them with the other nuts and grind into a paste if you want to, but many people prefer their kulfi to have some nutty texture left). Add the cardamom, the vanilla and the almond extract. 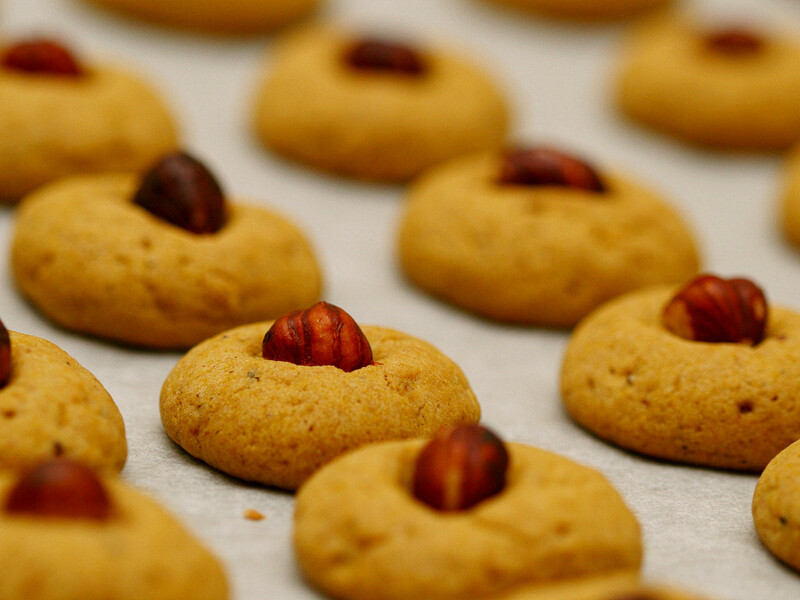 The almond extract isn't mandatory, but it's often used to enhance the flavor of pistachios. Heat the coconut milk and the sugar in a saucepan and stir until the sugar is dissolved. This step is not to caramelize the sugar or anything, just to fully dissolve it. Pour the coconut milk mixture into the rest of the mixture and mix well. Pour the mixture into 6-8 silicone muffin cups, small ramekins or even disposable cups, anything small that you can fit into the freezer (silicon muffin cups work the best if you want to serve them like in this picture). Let freeze completely, at least for several hours. Take out of the freezer about 15 minutes before serving and decorate with slivered almonds, coconut flakes and/or cardamom. Pasha is a Russian/Finnish Easter dessert, which normally contains quark, butter, eggs and cream. Yikes! It is luckily still quite easy to adapt to a vegan diet. Because it is so incredibly rich, the serving size is normally very small. This recipe makes 3-5 portions. Grind the cashew nuts and soy yoghurt into a fine paste using a blender or a food processor. Add all the other ingredients save for the last three, blend into a fine paste and check for taste (sugar/acid balance). Mix the last three ingredients together in a saucepan and heat until boiling and thickened (if using agar flakes, boil for some time according to package directions). Pour the agar mixture very slowly into the rest of the mixture while blending/mixing. After it is thoroughly mixed, immediately (because agar begins to set in room temperature) pour into a dish of your choice. Let set for a few hours in the refrigerator and enjoy. It keeps for about three days. The combination of coconut milk, maple syrup and real vanilla make for a truly decadent vegan rice pudding. This is a fairly dry rice pudding, so if you like a very creamy pudding you may want to increase the liquid by 30-50% and stir in the extra liquid when the cooking is done. You can likely make this pudding also using jasmine or basmati rice, but in that case the cooking time may be different. If you don't have ground vanilla beans, you can use liquid vanilla extract to taste, or cook a vanilla pod in the pudding. This pudding, like all porridge, is best made in a double broiler to avoid sticking. If you don't have one, you can use a non-plastic container partially submerged in water in a larger kettle (this is how I do it). Boil the rice in the water (the amount of water listed in the recipe placed in the innermost container, not the water in the outermost kettle, obviously) until it has been absorbed. Add the milks and salt and stir. Cook on low heat, stirring occasionally, for about one hour. Stir in the rest of the ingredients. You can add sugar or other sweetener if you desire additional sweetness. Serve with berries, fruit or jam, hot or cold. This makes about 3-4 portions. This is adapted from a recipe in the cookbook Vegan Lunch Box. I don't like the word "texmex", but I'm not sure how to describe these. It's not quite Mexican or Cajun but something like that anyway. I always cook my own chickpeas and never use canned ones, but this recipe isn't so picky on the exact amounts. I never measure the spices but add them to taste (note that the roasting will noticeably tone down the spices and even the amount of salt!). If you don't have smoked paprika, you can use chipotle powder, but really, some kind of a smoky paprika taste is a must. Drain the chickpeas and roll them in the oil and spices. Spread on a baking sheet and bake for 28-29 minutes in 200C/390F, stirring once after about 15 minutes. If you store the chickpeas overnight (or longer), keep them in an open container (preferably something like a plate instead of a jar) or they tend to get too soft. P.S. The chickpeas are also very tasty when marinated in this spice mix, even if you don't roast them! I recommend all of these books, roughly in this order. I've got most of these books as gifts. They are alright, but I don't recommend them nearly as heartily as the previous list. This book I got as a gift. It's not fully vegetarian even though the name translates to "WeightWatchers' good vegetable dishes", and I don't think I've ever used it. The recipes aren't very interesting or particularly healthy. Content by Maija Haavisto. Last modified: 21st December 2014.